UPDATE: In a statement by White House Director of Media Relations Helen Ferre, Trump has not yet spoken to the family nor does he want to pressure them, but members of the administration have been in contact with the Gard family. Rather, he is rather trying to be helpful "if at all possible." "Upon learning of baby Charlie Gard's situation, President Trump has offered to help the family in this heartbreaking situation," Ferre told a pool reporter. "Although the President himself has not spoken to the family, he does not want to pressure them in any way, members of the administration have spoken to the family in calls facilitated by the British government. The President is just trying to be helpful if at all possible." President Trump has weighed in on the controversy regarding British baby Charlie Gard, whose life support machine was ordered to be turned off despite his parents pleas to take him to the United States for an experimental treatment. Trump tweeted on Monday that if it's possible for the U.S. to help "little Charlie Gard," the country would be "delighted" to do so. Gard is the center of a heartbreaking case in the United Kingdom. Diagnosed with an incurable and exceptionally rare illness, mitochondrial DNA depletion syndrome, Gard has suffered extensive brain damage, has seizures, and cannot breathe on his own. An European human rights court rejected his parents' request to take him to the United States, on the grounds that doing so would cause additional suffering and would not be beneficial--despite the fact that the parents raised over $1 million for his treatment. Further, the hospital will not allow Charlie's parents to take him out of the hospital and let him pass away with them, which is what they have requested. Pope Francis has also spoken out about the decision, and reaffirmed that it is a "duty of love" to protect human life. In a statement released on Sunday, the Bishop of Rome said that he hopes the hospital will allow Charlie's parents to continue to care for him and be with him until he passes away, and that he will be keeping them in his prayers. Compared to some of Trump's other tweets of late, this one has received scant media attention. Which is a shame--this shouldn't be a partisan thing, and there needs to be attention brought to this case. 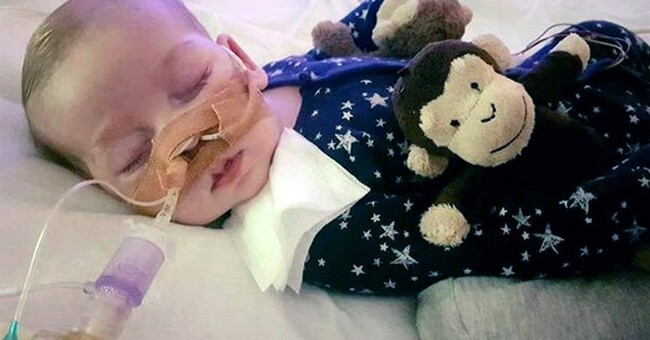 Charlie Gard's parents have the right to care for their child as they see fit, and a European court shouldn't be able to trump those rights.